We are excited to announce our clinics and tryouts for summer 2019. 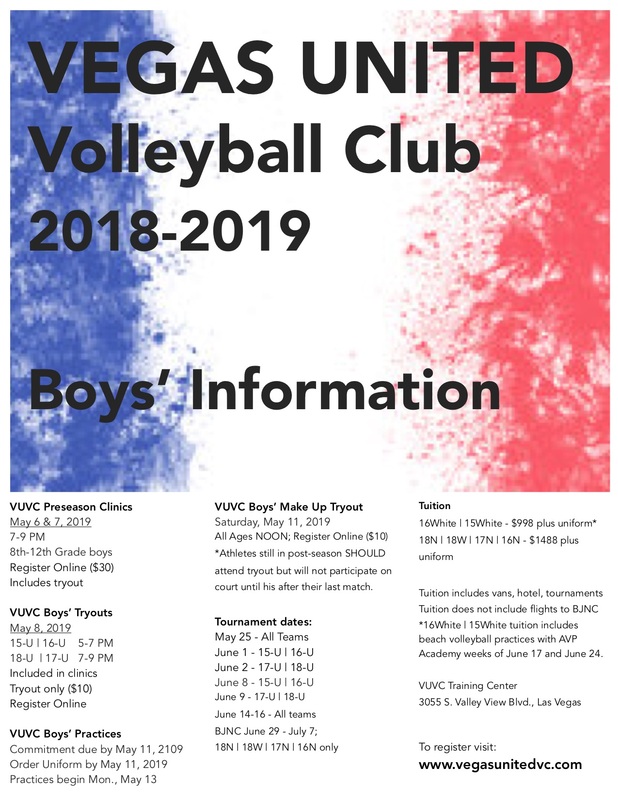 Preseason clinics will be held May 6 & 7 at VUVC Training Center. Come learn more about our program and what makes us so successful. Tryouts are May 8, 2019 and included in the cost of the clinics. 15-U & 16-U tryouts are 5-7 PM and 17-U & 18-U tryouts are 7-9 PM. We reserve the right to invite select athletes to join already existing teams. The make up tryout is scheduled for Saturday, May 11 and all ages should attend at noon. *Athletes whose teams are still participating in the post season SHOULD attend a tryout. We will not allow an athlete still in season to participate in any activities on court until his season is completed. Costs, schedules and information is contained in the information sheet above. Questions can be emailed to Coach Rios.